I’ve decided to use my blog for now to focus on the unbelievable events of the last week here in Nashville. Here is an email I just sent to our church family at Tusculum. For my blog, I’ve expanded on a few things and subtracted some others. If you happen to read this and want to help or if you read this and you need help, please call our Tusculum Floodline at 615-833-1660. I am so proud to live in Nashville. This city has truly come together. I am even more proud to call Tusculum my church family. Read on. You’ll soon see why. If I were writing an article for a newspaper column I would title the events I have witnessed in the last few days, “How Tusculum Helped Rescue Berwick Trail.” When we “adopted” this street three days ago we could have never known how much Berwick Trail might also help rescue us. As I reflect on so many things that I experienced this weekend, I can’t help but think that we (as a church family) have experienced a little glimpse of what life in the early church was like everyday. Listen to this description in Acts 2:44-45: “All the believers were together and had everything in common. Selling their possessions and goods, they gave to anyone as he had need.” That is exactly what I saw in the Tusculum family this weekend. Every time a need has come up, you have been there. I can’t believe how quickly you’ve given clothes, money, food, and manual labor EVERY time a need has arisen. I also can’t help but wonder, what if we lived like this all of the time? It just feels right doesn’t it? Almost like experiencing a little piece of heaven on earth. Why? Because we are living the way we were intended to live – for others. And in that moment all the world feels right because we are no longer focused on ourselves or our things. On my way home tonight, I stopped to take some of the money that you have donated for flood relief to a family who was living out of a motel after being completely flooded out. 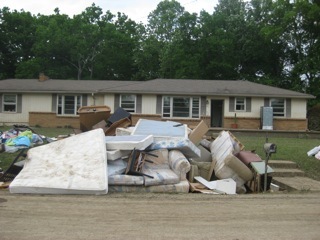 They are the Garcia family and the mom, Jennifer, called our Floodline yesterday. I can barely even describe what I saw tonight without tears. There were 3 adults (mom, dad, & grandmother), 5 children, and several pets all living in a tiny motel room on Murfreesboro Road. I was able to use money you’ve donated to pay for their previous 3 nights stay and one additional night. I also gave them $50 in gift cards to Kroger (again these were donated by Tusculum people). But they need so much more. There were 5 kids and they had lost EVERYTHING. They need clothes (especially school uniforms), toys, food, etc. I told these kids tonight in that tiny motel room not to worry because Tusculum was going to help. So let’s all step up and get them what they need. If we could get you to sponsor these children we could easily help get them back on their feet. I’m going to list their ages and sizes below. If you would like to sponsor one of these children please either call Jennifer directly or you can buy them clothes and I will get them to them. Please let me know what you are doing so once again we can evenly distribute. I’ll keep everyone updated. The oldest two children don’t even have uniforms for school tomorrow. Beyond that, this family doesn’t know where they are going to live. 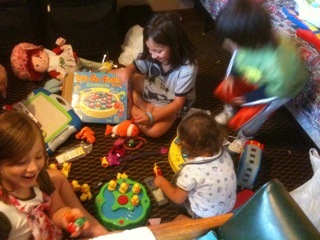 I don’t know how they can live in this tiny motel room much longer. 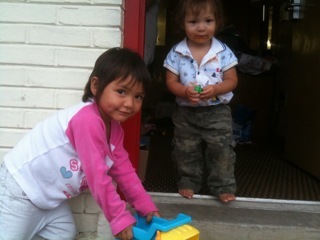 If any of you know of a better housing solution for them please, please let me know. It was truly one of the saddest things I have seen in a long, long time. Keep living the mission Tusculum. You truly are doing some amazing things to help Nashville recover and to help people see Jesus. I couldn’t be more proud to be a part of this church family! We received lots of clothes for the Garcia family! 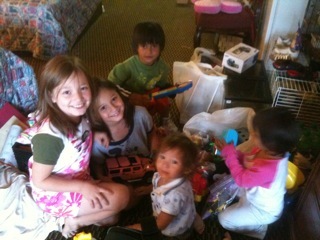 I delivered the clothes, toys, and supplies on Monday that so many of you bought for the Garcia family. I wish you could have seen the smiles on their faces in person but maybe these pictures can give you an idea. Thank you, thank you, thank you!!! You made a real difference with this family! For a little while they completely forgot about losing everything and I think for a few minutes they thought I was Santa Clause and it was Christmas morning. You are rescuing lives one family at a time!